Stone throw looks like run out throw in Cricket Ground. 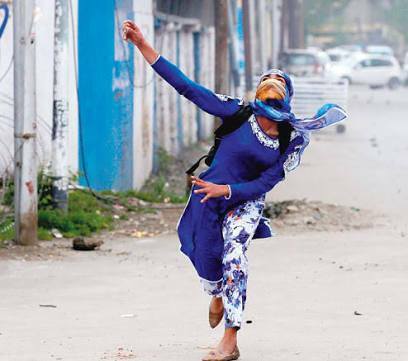 The stone throwers are now women in Kashmir. This new trends has awakened the Union Home Ministry. The home ministry held a meeting to deal with the situation prevailed in Kashmir. The women stone pelters will be faced with India Reserved Battalion which is going to be formed earliest. The formation of this 5th India Reserved Battalion will have women battalion, which have 1000 commandoes. These women battalion will deal with the women stone throwers. Force is facing difficulties to deal with the stone pelting incident in the valley. 1000 women constable in Kashmir police battalion will also be recruited. This battalion will face the stone pelting incidents in the initial stage. These women will be part of being formed five India Reserved Battalion in the state. 1 lakh 40 thousands youths have applied for the 5000 posts. According to information, there is much excitement for the women battalion and are seen 30 applicants for one post. The matter was posed in the high level meeting called on Sunday by Home Minister Rajnath Singh. This meeting was held to review Rs 80 thousands crore sanctioned in 2015 given by PM Modi to Jammu-Kashmir. India Reserved Battalion is being formed for the purpose to employ the youth of J&k. the out lay to stand every battalion will have the burden of Rs 61 crore expense. 80% expense will bear union government and 20%of expenses will have to bear the state government.